The Superbowl of gravel cycling. The Ironman of cycling. Whatever you want to call it, The Dirty Kanza200 which covers 206 miles of Flint Rock Hills gravel, has now firmly staked its claim as the premier gravel event in the US. Dare I say the world? After having spent the weekend in Emporia and raced the DK 200, I find myself wondering "Was this what Ironman was like in the late 80s, early 90's?" I just don't know, I got into triathlon when it had already been well established, had a peak and valley and was rising to its highest high (2009-2012) which since has not been matched. I make this statement due to the pulsating vibe that resounded throughout the small Midwest town stuck in between Kansas City and Wichita, KS. This race is not new, it's been around for more than a decade. Yet in just the past 3 years if you look at the results you can see the race taking on a completely different look. Riders with backgrounds in professional road cycling, cyclocross and even triathlon can be seen integrating into the lead pack and drastically changing the dynamic. With that said, I just wonder…is this the big wave that will truly move the needle of cycling in America? Will we, in the near future see a true race series that is all raced on dusty, rock laden roads where traffic does not exist and racers are directed via Garmins and Wahoos as opposed to lead vehicles and arrow signs? I came into the Dirty Kanza not quite knowing what I was getting myself into. I signed up on a relative whim with my buddies from The Cycling Formula. Lucky for me I got in via the lottery and figured I'd give it a shot. Looking at the race, the distance or potential time on the bike didn't faze me. Having raced countless Ironman distance races I've had the experience of doing a physical activity for 10 or 11 hours straight. I know the nutritional requirements…I know pacing. That seemed like the easy part. The stuff you could plan for. The scary part was the potential for mechanical issues. I'm talking about ripping the sidewall of your tire when you're 30 miles away from the nearest checkpoint and having no way to repair it or having your rear derailleur be torn off while riding through a knee deep river crossing with branches floating around like land mines. The potential for disaster is everywhere out there in the Flint Rock Hills. But what the hell, this kind of thing is right up my alley. I was going to go out there and SEND IT! 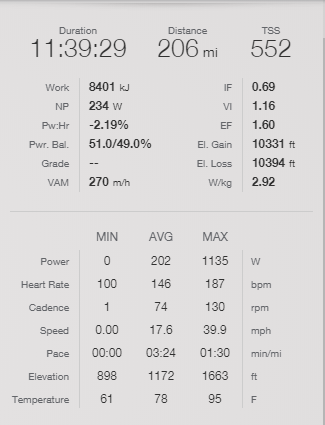 I probably should have done some more research…and maybe not raced a 3 day stage race the weekend before…and maybe not raced 1 or 2 times each weekend for the 2 months leading into this race. A lot of things I "could have" done differently for sure, but the fact is. I went into this thing thinking of it as more of a fun challenge than anything else. Sure I wanted to be competitive but that wasn't really my main goal when I had signed up. That slowly changed as I saw the people who were at the event and the vibe that was being generated. Don't get me wrong this is still a mass start event where people are just there for the adventure, the experience and the glory of just doing something that is just a little bit on the crazy spectrum….and frankly, that’s the beauty of it. One event to rule them all. Anyway, race morning rolls along and after a 30 minute delay due to a crazy thunderstorm rolling through we were off. All 1,000+ of us DK200 participants ripping down Main Street, Emporia all fighting to be at the front. It starts out as a neutral roll on pavement, but is more or less a moderately paced CX race where unless you’re a known quantity whom people are too scared to touch…you're getting bumped and jostled for position. No joke, elbows being thrown and moderate chops being employed. One woman did this no less than 3 times to be in the neutral roll. Once you make the turn onto the first gravel road things thin out as there are really only two lanes two ride. Those are the worn in tire tracks and you basically slot in behind someone and hope it’s a good spot. Minimal passing is done over the first 10-15 miles. After an hour or so the group of 1000+ naturally slims down to a couple hundred or so with that being whittled down yet again at about the 60-90 minute mark. There is a place called the pens where the cattle roam free (literally right across the road you're riding on) and wild horses run along side of you. It was at this point where the race had its first real efforts being made. Treating this as any other bike race where I was at without teammates I tried to stay as close to the front as possible to be sure I wasn't gapped by any other group. Becoming detached that early in a 200 mile race would be VERY BAD. Luckily my tires stayed inflated and I rolled through this section unscathed. Using Ted King as a measuring stick, I made sure to keep within a safe distance of any effort he made and also held back when I could see he was. It was a long day ahead and he's done this thing a couple times already. I had not. Once our pack was down to 20-30 riders there was an easing of the pace, people peed and I even had a nice chat with Jens Voigt….yup that Jens from pro cycling fame. Super nice guy, very friendly to everyone…and I am sure was compensated accordingly by Trek. Heading into checkpoint 1 in Madison is where my naivety came to light. I rolled over the timing mat in 3rd right behind Ted. I knew that I needed to find my drop bag and get my fuel for the next 65 miles to Eureka. However, the crew-for-hire option where I leave them a bag and they bring it out to the checkpoint was nowhere to be found. I had no idea where they were. Riders were stopping at their own tents, with their own crews and getting everything they needed. All while I was wandering around trying to find my bag. Long story short, I had no luck. I was at the end of the checkpoint and no one knew anything. I begged a lady for some water and she filled one bottle for me. One bottle and half a 50oz camelbak plus 3-4 gels was all I had. This was not good. Then the leaders went by me, they had made their stop and were heading out and my options were either to make sure I stayed in the front pack or waste more time looking for my drop bag. I made the decision to risk my low fuel and just ensure I maintained contact with the front pack. The speed and placement was just too valuable. In the long run it was indeed a dumb move, as we started the leg that goes from miles 48-103 we immediately hit a mug bog and I took on so much mud between my rear wheel and bike frame that I had to completely remove my thru axle wheel, scoop all the clay-like mud out and then reassemble everything and make a 15 minute chase back onto the group. So in the end I didn't get the fuel I needed and ended up wasting a bullet having to chase back onto the main group. BUMMER! In any case I was still in the lead pack and just knew that I needed to ration my hydration and gels. If I could just make it to checkpoint 2 in contact I'd be alright. As we went from miles 48 to about 95 the group was down to about 15-18 of us. Whether due to intensity, mechanical or otherwise, that was where we were at. This race, other than the odd very bad mechanical has a funny way of just kind of putting people into the groups they belong within the first 100 miles. Unlike a road race where if you get dropped early on your day is over, here its not that big of a deal you just find another group to ride with that is more your pace....no biggy. In any case back to the race. A long stretch of crosswind strung things out a bit as we neared Eureka and checkpoint #2. Ted King put in a little dig and distanced himself from the group. At this point I had already begged him for a gel, and by god the dude was so nice he gave me one of his Untapped Gels. He didn't have to, but he did. I owe him for that. However, having been out of hydration since about mile 80 I was running on fumes and decided to hang back just a bit. I knew that I'd probably get into checkpoint 2 about a minute behind but I wasn't too worried. I knew that I'd be able to fuel up, grab the second camelbak I had stored along with a nice snickers bar and a full pocket of Untapped gels and waffles. I was going to be alright. Then the realization of my mistakes happened. I did not research the race enough, I did not know that having a support crew or even a single helper would be such a big deal. After finding my bag I had to fill each bottle I had with water into the mix I had put in there the day before (no water allowed in bags beforehand), sort through and get the food I needed, lube my chain and all that other stuff. It might have only been 5 or 6 minutes…but in that time my seat at the front of the class was gone. I left checkpoint 2 and the race was up the road. I was solo and had 103 miles to go. NOT GOOD! Being alone with 100 miles to go quite frankly sucked. I was starting to hit the beginnings of the headwind that would be plaguing us for the remainder of the ride back north to Emporia so I just dug in and focused on keeping my heart rate and cadence up. Through the next 30 miles I caught one other rider who had blown sky high. He latched on for a bit, but when he asked me "How much farther the next stop was", my reply of "about 30 miles" was not what he wanted to hear. Shortly after informing him of the bad news we hit a pretty sizable water crossing. I road straight through it and he stopped before getting wet. He was never seen again. Well I mean he didn't disappear into the abyss, he just probably stopped for a break or something. A little while after the water crossing a lone rider past me, kind of out of nowhere. This was music to my ears because shortly after he went by I saw that a group of 5-6 riders were approaching. I decided to take a quick nature break and wait for the group to come by so I could ride with some friends for a while. We all banded together at what must have been between mile 130-135. The group was rolling along nicely along and with Matt Lieto, Paul Shirley and Cory Wallace we had some diesel power to barrel through the headwinds. Somewhere along the way the group was down to about 4 of us as we hit the third and last checkpoint in Madison at about mile 161. I made sure to restock my supplies as best as possible and got back on the road. In the shuffle Paul got out in front of the group and ended up latching on to another pack that ended up finishing about 10 minutes ahead of us. Kudos to him for being prepared and making quick work of the stop. That left Cory, Jesse and myself together for the final push to the finish. Honestly, at that point I was super thankful to have some companions as the headwinds were in full force. Cory was definitely the strongest of us, which after I learned of his background made sense as he is the current 24 hour MTB World Champion…so basically at hour 8-9 he was just coming alive, and also had flatted earlier...so it all kinda made sense. None the less I had these guys to keep me company and we all traded turns at the front to be a wind block. 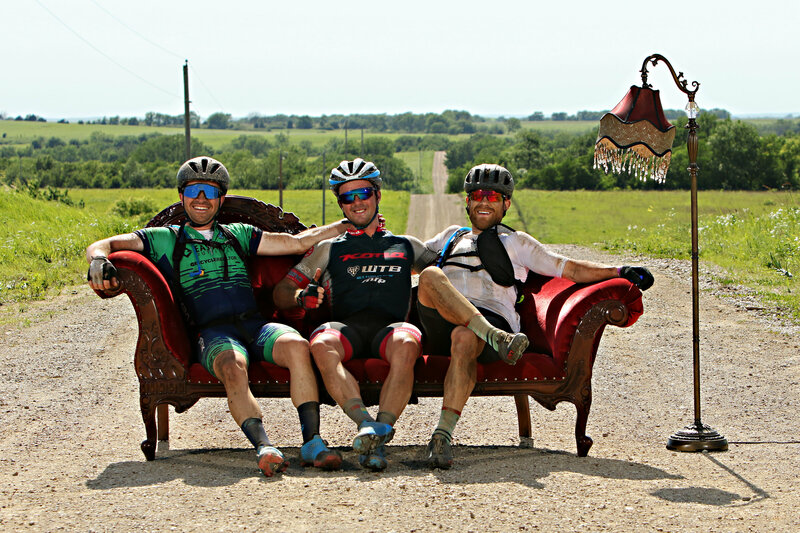 We even took the opportunity to commemorate our little crew with a nice picture at Salsa's "chasethechaise" photo op. A very cool idea by the company that only took a matter of seconds and an awesome photo came from it, along with a nice little patch. Thanks Salsa! A HUGE thank you to Adam at Gravel City Adventure & Supply Co.I needed some help with my bike and Adam took care of me big time. Not only did he fix the issue (and fast) he also made the recommendation of putting some different tires on. More suitable for the terrain. I told him "you're the local, I trust you. If you've got time to do it, go for it." He simply told me "I'll get it done"…and he did. And I am very thankful for the advice!! Thursday - 75 minutes in the evening. Friday - (Day Before the race) Used two times for 60 minutes each. While watching SAFE on Netflix, good show. Sunday - Used 90 minutes before heading to the airport. Again, nice to get ahead of the swelling that can be induced by sitting in a plane for 2+ hours.